How did you do? Here’s the answers for this month. Just wait till you see what we have in store for next month. As they say, everything is bigger in Texas! 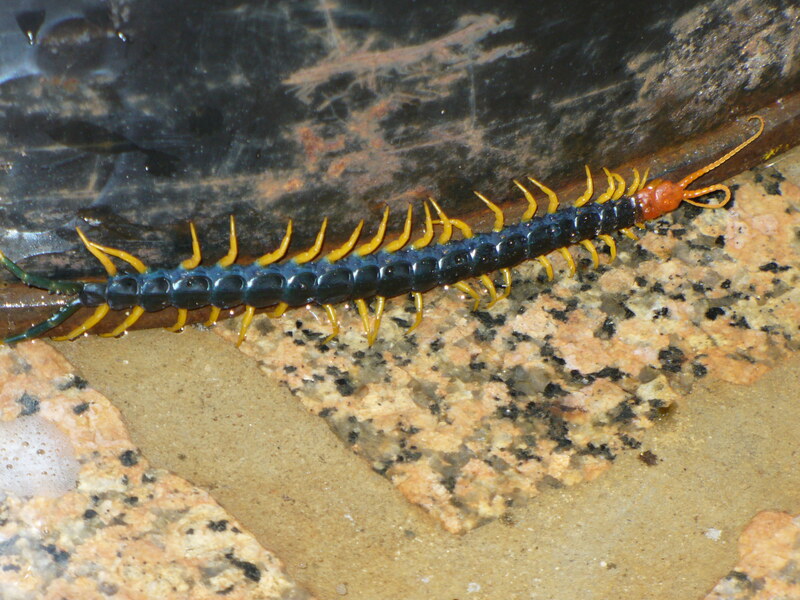 This is a Texas redheaded centipede. They can grow to 8-9 inches long and can live up to 5-6 years. Their bright color is a good warning to stay away. Not only do they have a painful bite but they can inject poison from each of the claw-like legs. They eat insects, mice and even small snakes. This is one insect you definitely do NOT want to pick up! Look but don’t touch! 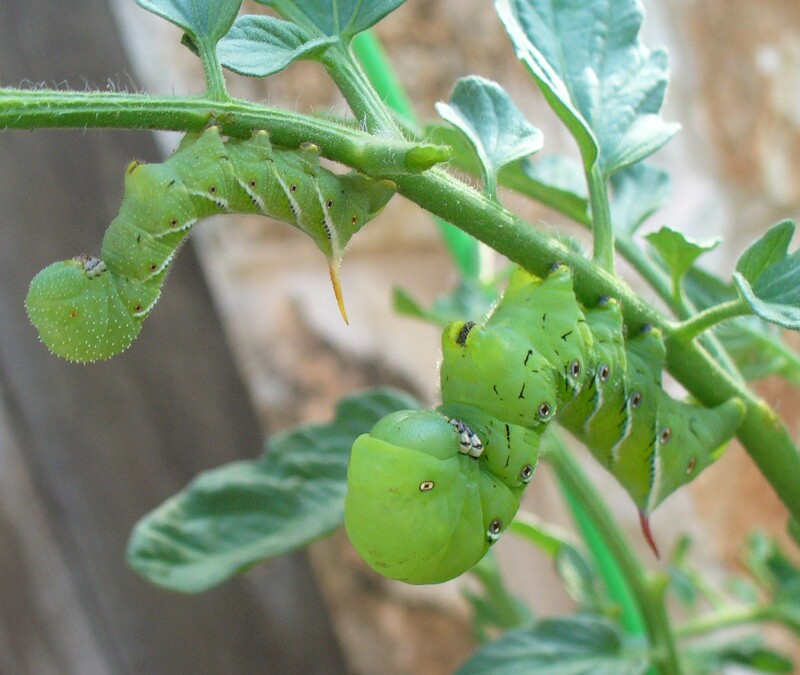 This is the caterpillar of the tomato sphinx moth, also known as a hornworm due to its interesting tale. The caterpillar turns into a beautiful moth that can have wingspans of 4-6 inches. It’s so large that it is often mistaken for a hummingbird as it hovers over a flower for a sip of nectar. Like most moths, the sphinx is usually out at night. It is listed as being a primary pollinator of Agave plants. 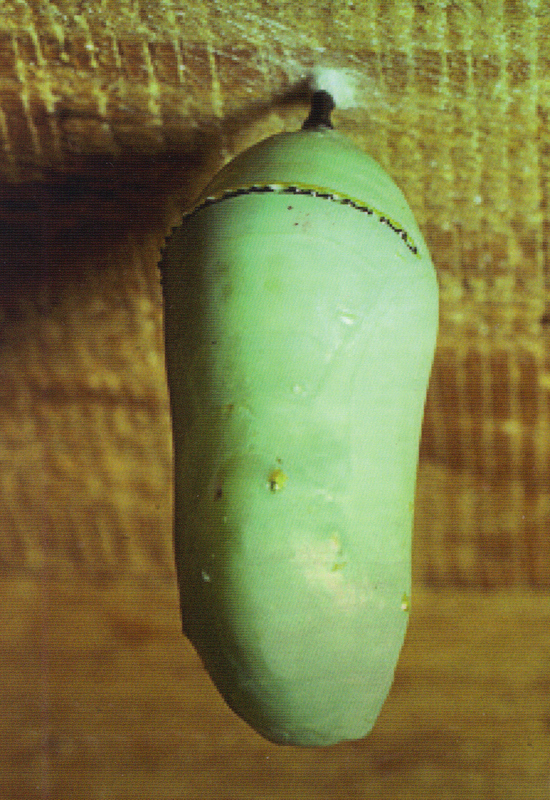 This is the chrysalis of a monarch butterfly. It appears as the caterpillar sheds its skin for the final time. Butterflies have a 4-part life cycle, from egg to caterpillar to chrysalis to butterfly, that usually lasts a mere 6-8 weeks. Sometimes confused with cocoon, the chrysalis is the hardened pupua of a butterfly. A cocoon is the silk casing spun or constructed by a moth or other insect to protect its body as it goes through metamorphosis. Some moths spin the silk for their cocoon while others use whatever is handy, such as leaves, grasses, to construct their cocoons. Take this link to see a cool video of a caterpillar transforming into a chrysalis. Take this link to see a lovely time-lapse video of a monarch butterfly emerging from its chrysalis. 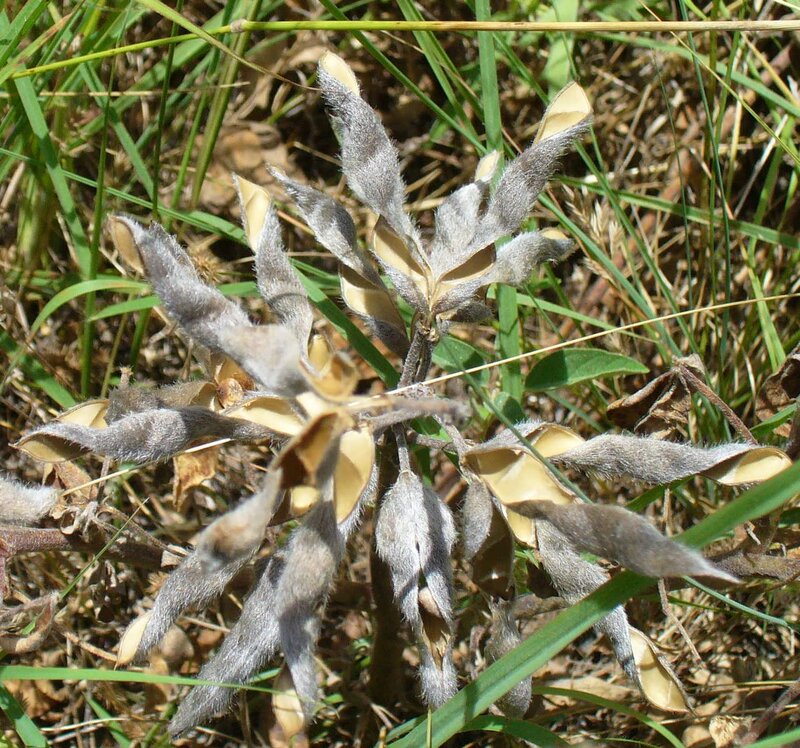 These are the seed pods from Texas’ most famous wildflower, the bluebonnet. Lupinus texensis is the official scientific name (just in case you want to show off to your friends). The seed pods grow straight as any other seed pod might. As the seeds within ripen and the pods turn from green to brown, the pods spring open with a twisting motion to fling the seeds away from the parent plant. It’s a unique technique that ensures the plant spreads beyond the initial flowers. The tough shell ensures that the Bluebonnet can survive drought and even the stomach of animals who may choose to eat them. The seeds need to be scarified, either by nature or with the help of a gardener (that means us!). For a great article on how to get your bluebonnet seeds to grow, check out the Lady Bird Johnson Wildflower site. This is the skin of a snake. About once a month, snakes shed the top layer of their skin in one piece, including the eye cap, from head to tail. 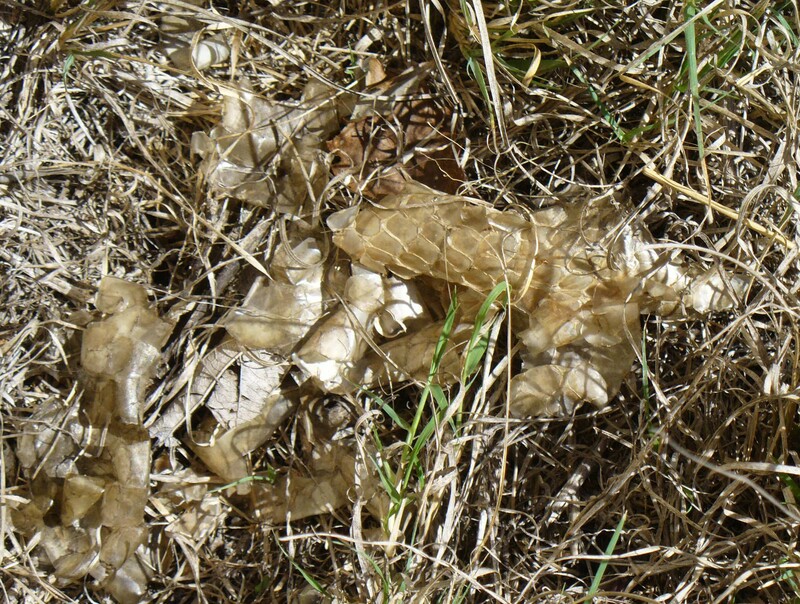 It may take up to 7 days for a snake to completely shed it’s skin and during that time, it will not eat. Since the skin of the snake does not grow as the snake grows (like it does in humans), it must shed the outer layer during each growth cycle. So younger snakes shed more frequently than mature snakes. In fact, all reptiles shed their skin as they grow. Lizards look like they have a really bad case of sunburn when they shed. So, when out on the trails, keep you eyes open and look up, down and all around. You’ll see lots of fascinating things! Mouse nibbling on grass seeds for a snack. Did you know there are more than 60 different species of Rodentia in Texas? They are the most common mammal in Texas. They include squirrels, beavers, gophers, and, like our little friend here, mice. We were not able to catch the mouse and examine it to determine the exact type of mouse. 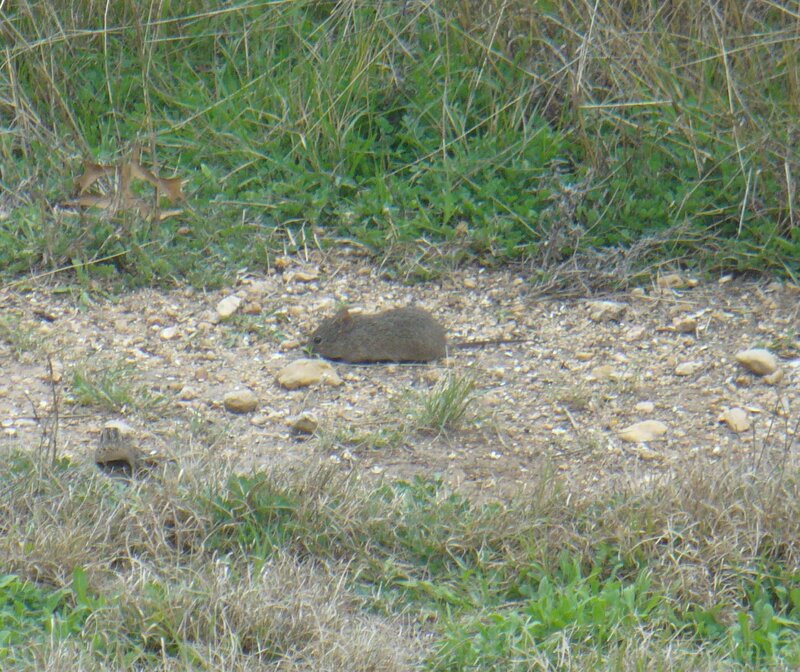 If you ever catch one, you can use the guide posted by TPWD to help you classify the mouse, as well as other mammals. They describe counting toes (front and back, seeing whether it has white feet or a golden underbelly, the length and height, and even the shape of the teeth and tail. It’s always fun to see what you can spot when you go for a hike! 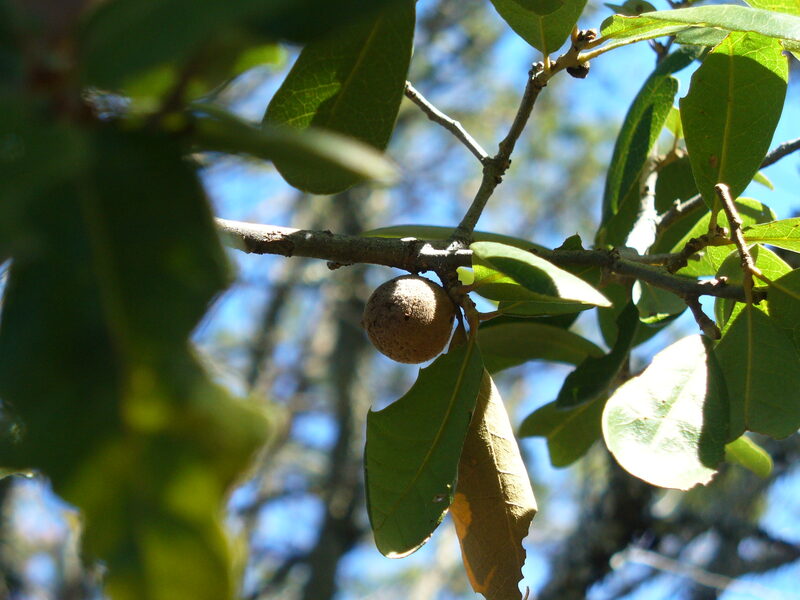 This is an Oak Gall Wasp nesting spot. After the female deposits the egg, the developing larva secrets a chemical that causing the plant tissue to swell and grow around the larva to protect it as it matures. There are over 600 species of gall wasps in North America. You can usually tell the species by the size and shape of the gall it builds. The gall wasp uses parthenogenesis to reproduce; larva develop without the egg having been fertilized. A big word for a very interesting characteristic of these gall wasps. Noticing a curious indentation in the stone. The shape of the metate is formed by long-term grinding of maize (corn), acorns and other food stuffs. The deeper the metate, the longer the site was in use. The mano stone was held in the hand and the maize kernels were ground against the hard stone surface of the metate to produce a rough meal or flour. This was used to make flat breads like tortillas or porridges. Did you guess raccoon? 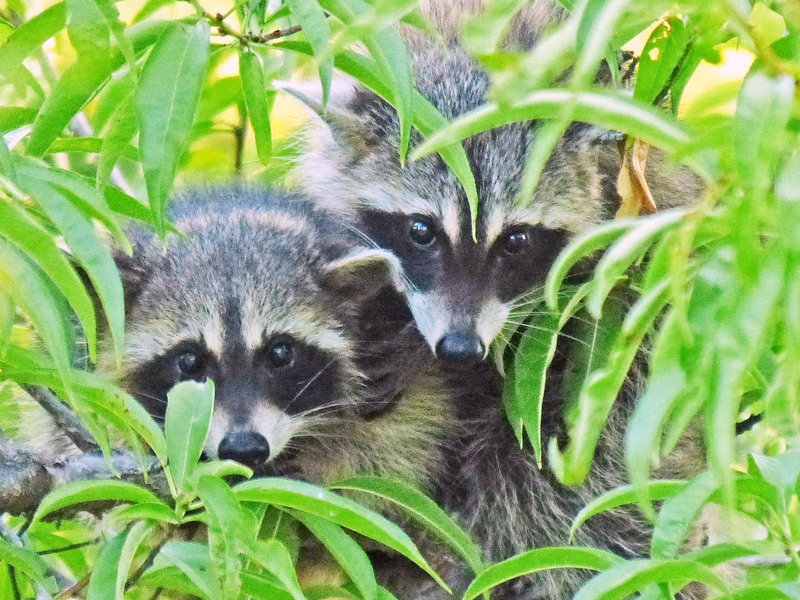 In addition to seeds and fruit, raccoons also eat insects, fish, frogs, lizards, and bird eggs. While they are cute, they can also be vicious. They will snarl and pounce when threatened, or when a competing raccoon gets too close to their food. 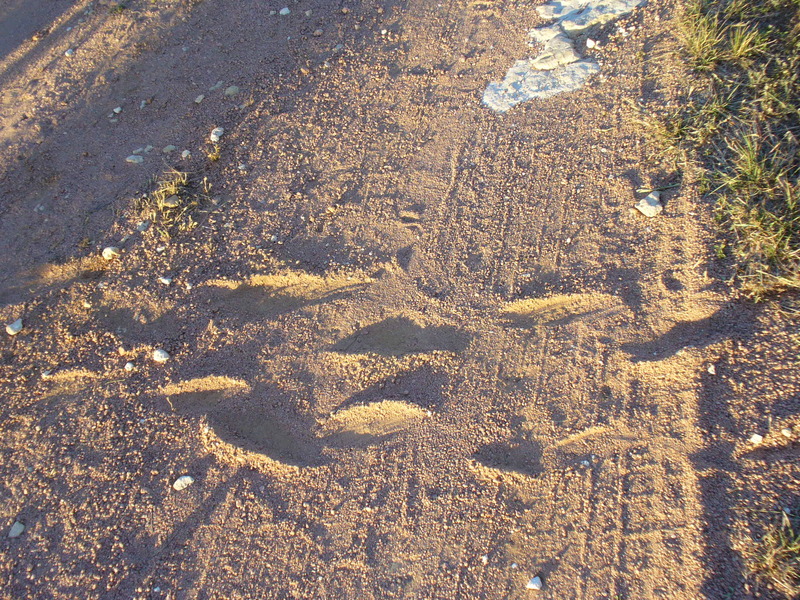 These tracks were made by a large snake. Later in the day a second photo was taken, perhaps not of the same snake but clearly a close relative. Notice that the photographer stayed far from the snake. 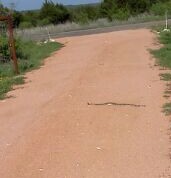 Rattlesnake crossing the road to get to dinner! Given the driveway is 14 feet wide, you get a very good feel for the size of this particular rattlesnake! After the snake had crossed. we saw the same tracks we had seen earlier in the day. All dressed up with some place important to go! 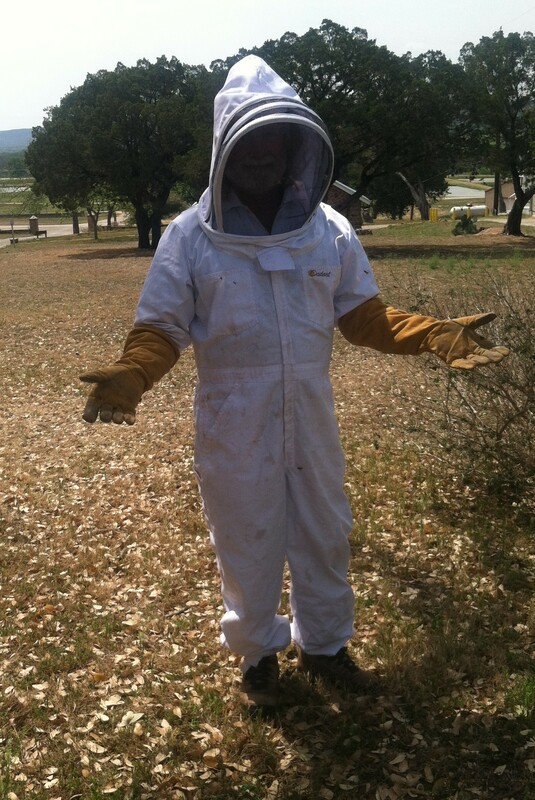 Billy Huston is dressed up to deal with a swarm of bees that were found clinging to a tree at the Fish Hatchery (see the original photo) near Inks Lake. Bees typically swarm in the spring, looking for a new nesting place for their queen, as the population outgrows the old hive. Scout bees found this tree as a convenient resting place, where the swarm could gather away from their original hive while they scout for a new nesting location. In this case, Billy, being the bee enthusiast he is, was able to help them find a safe new home, near water and close to their favourite nectar producing wildflowers and plants. 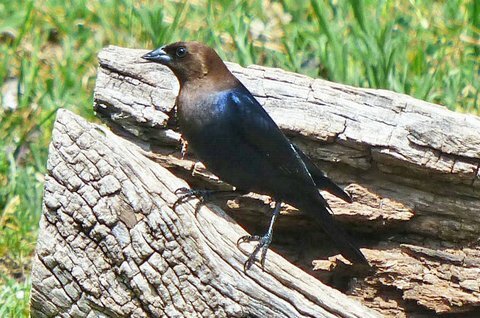 This is a brown headed cowbird. It is indeed a most unwelcome visitor. They can be spotted often at feeders, in open fields and meadows, or at the edge of woodlands. Their negative impact on the songbird population has such that the Texas Parks and Wildlife Department have declared them as a brood parasite and have set up special training programs to help ranchers and framers trap them in an effort to slow their spread. This plant is an epiphyte. It draws its moisture and nutrients directly from the air, mist or rain, and any debris that might collect around it. An epiphyte is not a parasite and does not take anything from the tree on which it is growing. A more common name for epiphytes is “air plants” since they don’t require any soil. Other epiphytes include orchids and Spanish moss. Epiphytes only harm the host tree if the mass becomes large enough to weigh down the branches, or dense enough to prevent sun reaching the leave of the host tree. It’s one of those odd quirks of nature that it so interesting and such fun! A good trivia question for your friends. 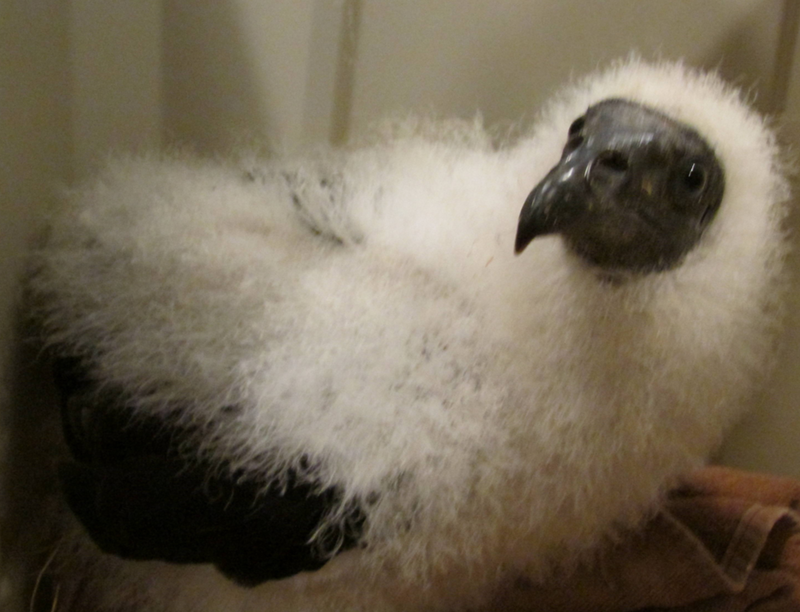 This is a fledgling turkey vulture. 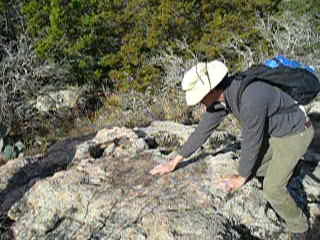 Well known as scavengers, they are year-round residents in the hill country. When threatened, vultures have been known to expel the gruesome contents of their stomachs up to 10 feet away in an attempt to repulse a predator. The shape of the seed pods was the clue — they look like the head of a crane, hence the name cranesbill. 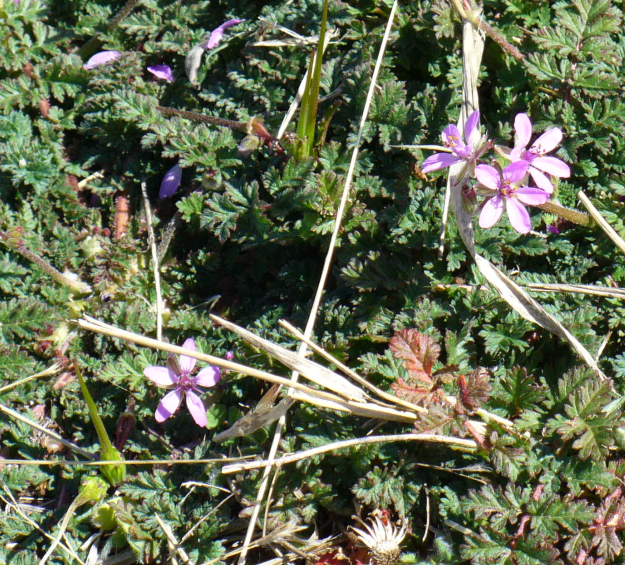 They are a close cousin to the storksbill and are a species of geranium. Like other flowers in this species, they are used in native medicines and fragrant oils. Looks like everyone’s home…. time for a party! This is a family of barn swallows. 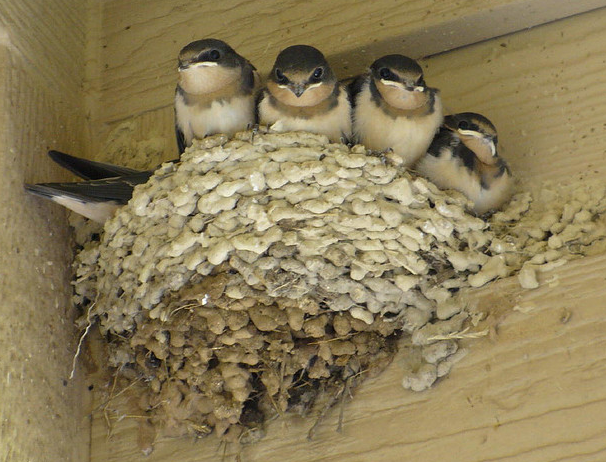 They enjoy insects and place their mud-and-grass nests in sheltered areas such as bridges, house porches or barns. 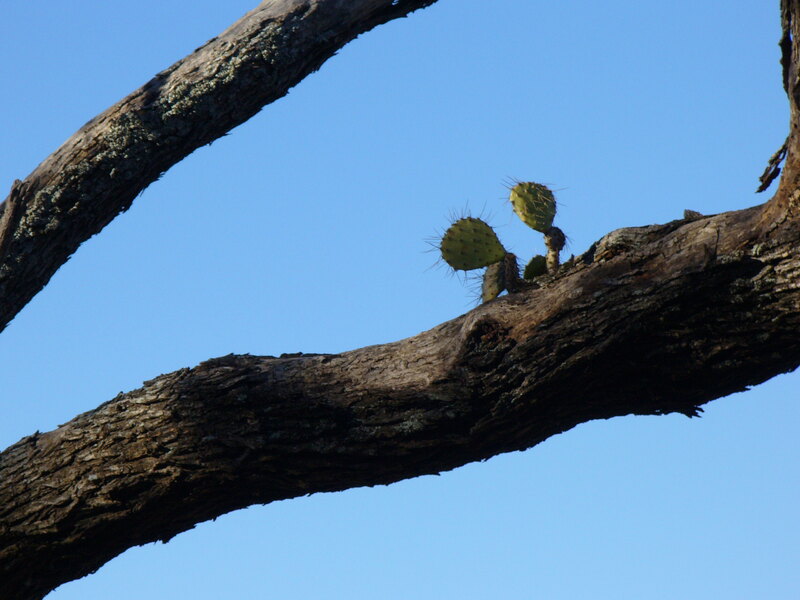 The cactus found its way up the tree and out on to the limb thanks to a hungry mammal, probably a raccoon or a ringed tail cat. When the animal consumed the seed pod, some of the seeds passed thru its digestive track and were deposited as waste on the branch. In and around the nature center, you may see cactus growing in other strange, out of the places, and know that an animal had a tasty snack and then, nature took its course. A source for life in a dry place. 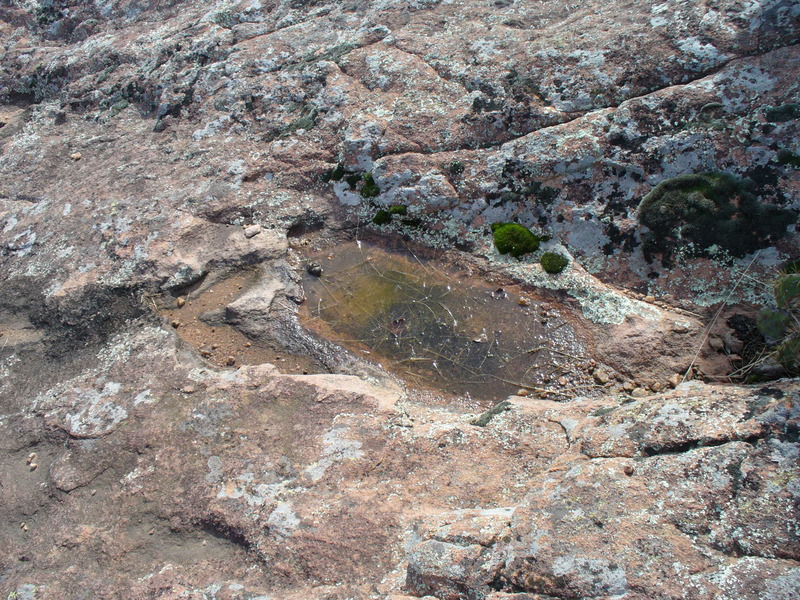 This is a vernal pool, so named because most occur during the spring, or vernal period, when rains are typically the heaviest, most frequent. However, they can occur at any time during the year and are a critical resource for our wild life friends.